Energy Free is designed to equip building professionals and homeowners alike with a toolkit for creating homes that use no more energy than they produce - this means homes that are free from the vagaries of energy-price fluctuations that help to free society of the high political and environmental costs of fossil fuels. Energy Free offers a wide array of resource information, including detailed window and insulation comparisons, assessments of the relative contribution of different building elements; and overall performance. It draws on research and empirical data from myriad sources, including the Department of Energy's Building America Program; Sacramento Municipal Utility District's House of the Future; Passiv Haus Institute in Europe and the Passive House Institute in the U.S.; Florida Solar Energy Center; Living Building Challenge; Affordable Comfort, Inc.'s Thousand Home Challenge; and many pioneering individual home projects across North America. Ann Edminster is a recognized national expert on green home design and construction. She is a principal author of the LEED for Homes Rating System, and consults to builders, owners, developers, supply chain clients, design firms, Investors, entrepreneurs, non-profits, and public agencies. She sits on the advisory boards of a number of green building companies, is a contributing editor to GreenBuildingAdvisor.com and Ultimate Home Design, and has consulted on numerous LEED Platinum Home projects that are targeting multiple high-performance ratings and certifications, including zero-energy. She is a widely-acclaimed green building educator and facilitator and has been a co-organizer of numerous international peer-to-peer conferences. 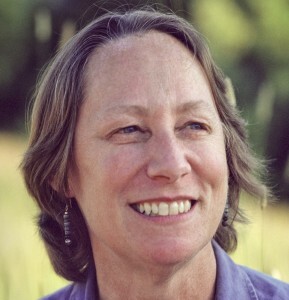 Her book, Energy Free; Homes for a Small Planet, is based on the work of scores of national experts and leading organizations, and offers guidance on net-zero energy home design. She lives and works in Pacifica, California. 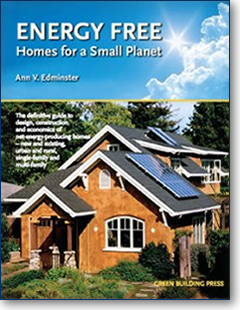 "In Energy Free, Ann Edminster brings her wisdom and clarity to the issue of net-zero energy homes. With so attention being paid to energy savings and reduction of carbon emissions, we need a book like this that helps us sort through the confusing technologies, claims, and economics to create homes that are better for the planet and better for your budget." "At a time when it is critical to remove the mystique and uncertainty about the choices people can take to be part of the climate change solution, Ann Edminster offers a compelling road map for zero-energy homes. This veritable primer, filled with essential why, what, and how guidance, will be valuable for everyone wanting to apply proven, straightforward and cost effective zero energy knowledge to their residential realities." "Ann's penned a masterpiece, a well-written, accurate, and comprehensive guide that will help homeowners, builders, and architects achieve one of the greatest and most vital feats of all time: creating homes that produce as much - and sometimes more - energy than they consume each year! If you're looking for ways to dramatically reduce your carbon footprint while saving a fortune in utility costs, this book is for you." - Dan Chiras, author of The Homeowner's Guide to Renewable Energy, Green Home Improvement, Power from the Sun, The Solar House and Power from the Wind. "This well-written book is appropriate for all audiences - building professionals as well as interested (and perhaps even better, disinterested) laypeople. The first two chapters lay the groundwork: what "net-zero" means, and why it makes sense for the planet and the pocketbook. Chances are good that just about evereybody cares about one or the other of those things, if not both. The remaining couple hundred pages get down to the business of making it happen - no mean feat, given the array of climate zones, building sites, material choices, occupant behaviors, etc., that have to be contended with. This book guides the reader through all of it with grace and depth, augmenting the highly readable and exceptionally informative text with truly helpful illustrations, chargs, photos, and even some construction detail drawings." "I've been planning on building a new home - and until I read this book, I had no idea how to approach "green" building. There are a lot of choices out there, but not many have anything helpful to say. Energy Free helped me appreciate which building ideas are most practical for my project, and which to throw out. It's likely to become my bible as I proceed. It's clear the author has done her homework, and I'd recommend this book to anyone thinking about how to build something that consumes the fewest natural resources. It's very well done." "I own a small company that is trying to convince local government to invest in net zero development for their low/moderate income housing stock. This book has been invaluable in that it spells out the conceits of how you define net zero, how you get to net zero, and why net zero is important as we move deeper into the 21st century. If you are an architect, buidier, homeowner, or government official, I think there is something of value here for you. It does a good job with broad concepts as well as explaining the technical minutiae in accessible language. If you need more detail, the book provides great places to go for additional answers. In short, if you are interested in net zero housing, you should buy this book." "It's rare to find an author whose passions are matched by an ability to articulate them this well. Ann Edminster's masterful use of the written word makes this an accessible and enjoyable read for audiences of all backgrounds."